On International conference organised due to the 10th anniversary since the inscription of the UNESCO World Heritage Property «Primeval Beech Forests of the Carpathians and the Ancient Beech Forests of Germany, was an excellent opportunity to award the European Wilderness Society Platinum Certificate to Uholka-Shyrokyy Luh Wilderness! This Wilderness is a large contiguous area, embedded into the Carpathian Biosphere Reserve and is one of eight areas, located in different districts of Zakarpathia Region. said Vlado Vancura, Director Wilderness Development of European Wilderness Society. The area is psrt of the beech forest belt on the southern slopes of the East Carpathians, and comprises the upper basins of the Mala Uholka, Velyka Uholka and Luzhanka rivers at altitudes ranging from 400 to 1400 meters a.s.l. In 2016 and in 2017, a team of European Wilderness Society auditors visited Uholka-Shyrokyy Luh Wilderness for 12 days and carried out the detailed Wilderness assessment according to the European Wilderness Quality Standard. 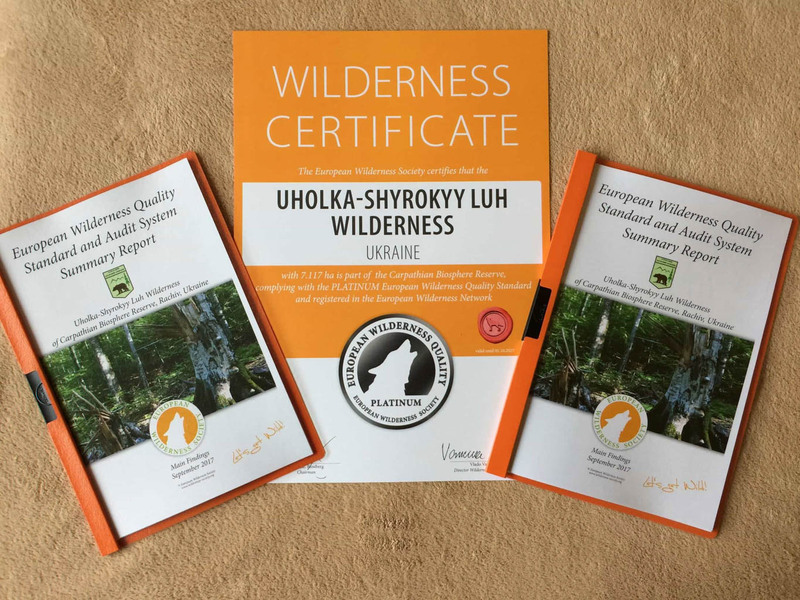 The European Wilderness Society team verified 7,117 hectares of Uholka-Shyrokyy Luh Wilderness and awarded the Platinum Wilderness Certificate. The size of Uholka-Shyrokyy Luh Wilderness zone is identical with the size of WILDForest and the area includes 3 WILDRivers – upper watersheds of Mala Uholka River (7 km), Velyka Uholka River (8 km) and Shyrokyy Luh River (9 km).